There are so many aspects of physics involved in broomball that one could write a lot on them. However, this page is intended to give an overview of the major aspects of physics involved in the game of broomball. Broomball is a game that is played on ice and is much like hockey. However, broomball isn't played with skates or a puck. The ball is about 5 inches in diameter, and the sticks are shorter and differently shaped than in hockey. There are 6 players on each team. Three forwards 2 defenders and 1 goalie. The object is to score goals while defending your own. For more information check out my links page, here. 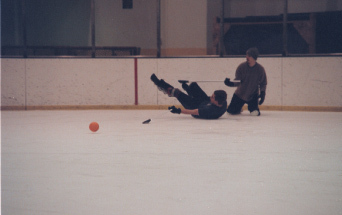 Perhaps the biggest consideration physics-wise in broomball is the playing surface. The ice can make the game very challenging weather or not you have the proper equipment. The equipment can help one hit the ball better and faster. The proper equipment can help one run faster and better on the ice as well as provide protection against injury. Of course having a proper ball really helps to make game play more fun. The ball's design is very interesting and from the physics point of view very ingenious. The ball can come with different patterns and design on the outside although the overall design among the balls will be very similar. If you are interested in finding out more about the physics of broomball than please explore my page further.